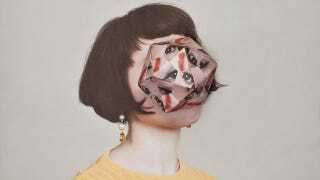 Alma Haser's Cosmic Surgery series is a bizarre take on portraiture. She photographs people, then makes origami structures out of pictures of their faces, then places the origami on top of the original portrait, creating a strange and fascinating blend of two- and three-dimensional images. Haser explains that she means to create images that are both familiar and disquieting. Because the combination of the origami with the portraits strikes her as alien and futuristic, she feel that they are best suited to the younger generation. After photographing a parent with their child, Haser prefers to place the uncanny origami faces on the child, bringing the child into the origami future while leaving the parent behind, untouched.